If Kingdom City has a hero, then G is it. Always quick to help out others in need while maintaining a self-protective distance. That all changes when G takes an instant liking to Dub and decides to be his protector when Dub crosses paths with Money D. Now the hero is hip deep in trouble and watching out for his friend has become a full time job. Just a reminder that "Dub" is a character we haven't reviewed yet (come back for Old Toys Month 2019), and "Money D" is one who was never made. With the full story Palisades had ready to go for this property, it's a shame nothing ever came of it. I wonder who owns the rights to it, now? It'd make a decent [adult swim] property. 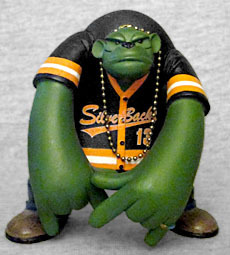 The Crittaz (originally named Urbanimals, but changed for reasons) were meant to trade on the "designer vinyl" style, but still, it's hard to believe that a pseudo-animated gorilla toy just happens to have similarities to the art of Tank Girl creator Jamie Hewlett - one of the two guys behind the creation of Gorillaz. 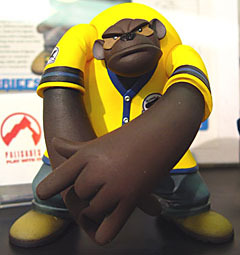 G has a head that looks more like a monkey than a gorilla, wide instead of tall and featuring big ears. His back has a hump that rises up higher than his head, and the shirt he wears falls smoothly down to his waist like a bell. His already-short legs lose even more height because he bends at the knees, while his arms are so long that his fingers drag on the ground. Unlike many cartoon characters, he actually has four fingers, not just three; both hands have the index and pinky fingers extended, like he's flashing Dr. Strange signs. His jeans are sculpted with a fine texture, and even seams to make them look more realistic. When this figure was shown off at Toy Fair 2003, it had a much different colorscheme - all the Crittaz did. The trend in the paint seems to have been to change from something at least somewhat "natural" to something wilder - for instance, G's original intended color would have given him dark brown fur with a lighter shade for the bags under his eyes. And since the body would have been so dark, he'd have worn a brighter shirt, a startling canary yellow with blue trim. A pretty cool look, but not what we ended up getting. 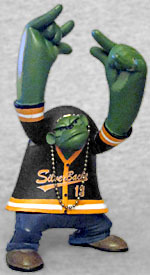 Right off the bat, his arms and face are a dark green, which is not a color you find on gorillas out there in the wild. 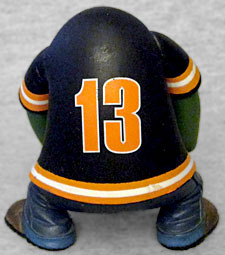 He has beady black eyes and a solid black nose, both done with glossy paint, while his black shirt is matte; it has orange and white trim, and a sports-team logo proclaiming that G is a fan of the "Silver Backs" - appropriate choice for a great ape - and proudly wears #13. If that number has any intended meaning, we don't know what it is. He wears a ring on his left pinky, but while the band is gold, the stone in it is green, meaning it blends in with his hand all too well, and ends up looking like a paint error rather than an intentional choice. G has swivel joints at the neck, shoulders, and waist. If you're not careful about how you pose his head, his right ear will scrape paint off the inside of his sleeve when you move his arm, and you also need to make sure you don't have his hands down lower than his feet are. His only accessory is a beaded chain necklace that drapes over his head, and is held in place by his ears. The toy stands almost 3¼" tall, and although Palisades viewed him as the hero of Kingdom City, he's definitely not the most interesting character design in the lineup. And not even being the original colors would have helped him much.